In order to stay true to my roots in flyover country, I included “a casserole” on my list of 30 recipes. It was intentionally vague. I have a limited casserole experience and even less casserole knowledge. Yet, the casserole is a pillar of life in flyover country. Having at least one delicious casserole recipe in my repertoire will be a right of passage for me. A casserole, technically, is pieces of meat or poultry and vegetables baked with a binding starch and some form of liquid, often accompanied by a crunchy topping. It is different from a stew because you bake it rather than cook over heat on a stove top. The problem is, I don’t have any tried and true, delicious casserole recipes. My mom occasionally made the one with scalloped potatoes and ham, but few others. Confession: I didn’t eat green bean casserole until I was in college. We never had it….ever. No, it was not even part of the Thanksgiving regalia. SECRET: I don’t really even like it. The infamous green bean casserole, absent from my childhood home. The goal is to make a casserole on Sunday evening. Sunday is the four+ hour LOST finale extravaganza, so I will be out of the kitchen and on the couch. Perfect night for a casserole!! SO– I’m soliciting your recipes and suggestions. 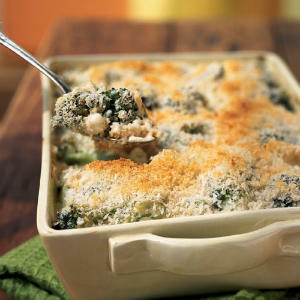 What is the best casserole you’ve ever had? Is there a recipe that puts all other casseroles to shame? Are there <gasp!> gourmet casseroles out there? And include the story. Is this the tater tot casserole your mom makes when you come home? Is it the tuna casserole your spouse begs you to cook? Is it the recipe off the back of a soup can label? ** Leave me a suggestion in the comments or email me at theflyoverfoodie@gmail.com. Thanks in advance for sharing!